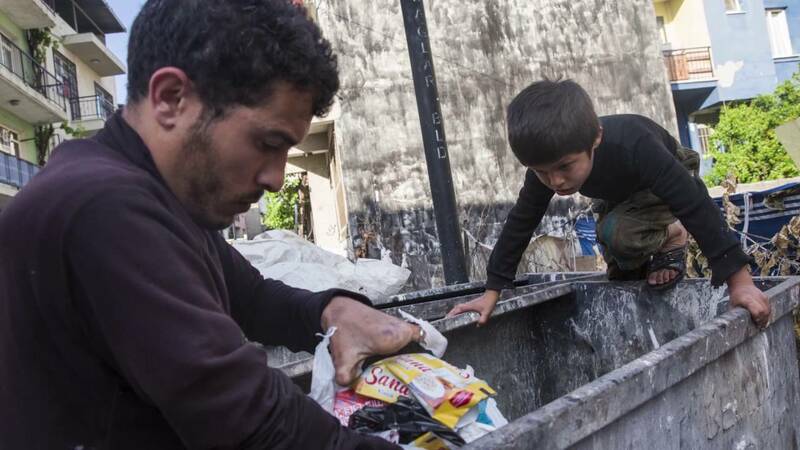 IZMIR, Turkey – A man and a boy crawl into a garbage bin. They are collecting cartons, plastic and cans to sell to help feed their family. The brutally tiring work starts just after dawn and often goes on almost to dusk. Even just walking the route of more than 10 kilometres is tiring. The man is Firaz and the boy is Uday, his seven-year-old son. Firaz, 25, is missing part of his arm and three fingers on the other hand. He lost them in industrial accidents when he was a boy. After bombs destroyed his house in Syria, he fled to Turkey with his family eight months ago and they now live in Izmir. Every day he takes what he gathers to a collection point. He is provided with a trolley and he trudges back, hauling a load of up to 100 kilograms, his left upper arm hooked over one handle, his injured right hand awkwardly clutching the other. For this backbreaking work he receives the equivalent of five or six dollars a day. Sympathetic Turkish passers-by frequently give him small donations. Uday sometimes misses out on school, which he attends, for the odd day or two to help out his father. He climbs deep into the bins to reach bottles and cans at the bottom. Home is a refuge for Firaz, although the rent takes almost all his income some months. There, he retreats to eat, sleep and be with his wife Amina, his daughters and Uday. When he plays with the children, his face breaks into a smile. However, the place is bare, with just a few blankets, a rug and mattresses. With barely enough money for the rent, there is little left for heat and the winter was cold. Firaz has been identified as vulnerable by ASAM, the Turkish NGO that works with UNHCR, the UN Refugee Agency. UNHCR has helped him with vouchers, clothes and blankets. Officials say more funding and more help for refugees are needed. The children are young and Amina sees her role as one of encouraging them to be optimistic. More help is on the way. The UNHCR office in Izmir will be working with Turkish officials to lessen the economic burden on the family. Firaz is both grateful and embarrassed. “If I wasn’t disabled, if I had my arms, I would work hard and make money and I wouldn’t accept any help from others,” he said.